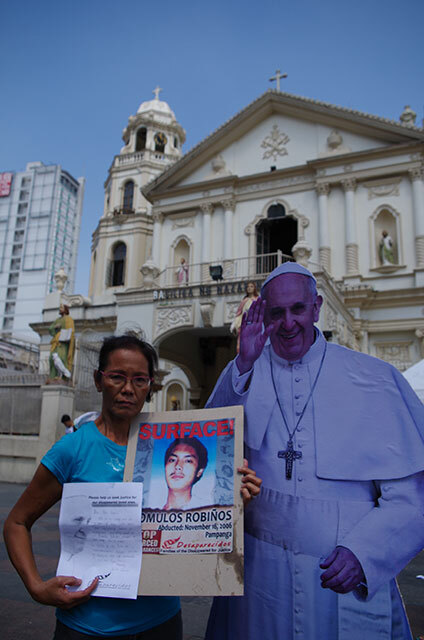 MANILA, Philippines–Edita Burgos still lives with the hope that her missing son, farmer-political activist Jonas Burgos, will one day knock on her door and announce that he’s home. But after seven and a half years of searching, which included examining yet-to-be identified tortured bodies, the 71-year-old mother is prepared to accept the worst. 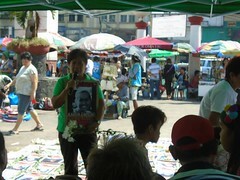 “We are idealistic in the sense that we still hope to find him, and realistic to accept the possibility that he could already be gone,” Edita said in an interview, after taking the stand at the Quezon City Regional Trial Court in the arbitrary detention case against Army Maj. Harry Baliaga Jr.
Baliaga was declared responsible for the enforced disappearance of Jonas in the investigation report of the Commission on Human Rights (CHR) and in the decision of the Court of Appeals in the habeas corpus and amparo petitions filed by Edita. The prosecution on Thursday presented Edita as the first witness to identify Baliaga, to talk about the abduction and subsequent search for Jonas and to prove damages. The cost of searching for Jonas has run up to millions, using up the family’s savings, Edita’s retirement benefits, as well as the death and retirement benefits of her late husband, press freedom advocate Jose Burgos Jr.
“The impact of the loss of my son is unquantifiable. You cannot put a price to the broken heart, the broken family, the loss of a son,” Edita said. Baliaga, sitting on the second row in court, mostly kept his arms crossed and displayed a slight frown while Edita testified. Baliaga said he was teaching at the Philippine Military Academy in Baguio City when he was tagged in the abduction and was subsequently assigned to the Army headquarters in Taguig City. He said he liked his PMA post because he was near his family in the Mountain Province. “Whenever they (Burgoses) look at me, I can see that they’re very angry with me. I’m just hoping that later on, the truth will come out,” Baliaga said. “They took my son’s right to defend himself,” Edita added. Edita told the court that the family called and sent text messages to Jonas when he did not come home on April 28, 2007. Jonas only answered the following day and he was incoherent. Edita kept asking where he was and why he did not come home. He only said, “I was taking a bath” and “Sorry, let’s talk tomorrow,” then the line went dead. After a press conference to announce that Jonas was missing, Edita received a call informing her that her son must have been the man who was kidnapped from the Ever Gotesco Mall in Quezon City. The Burgoses rushed to the mall and a waitress said she saw Jonas being taken away by a group of about four men and a woman. The mall security guard took down the license plate of the group’s vehicle and it was traced to a vehicle impounded in the camp of the 56th Infantry Battalion in Bulacan province, where Baliaga was then a first lieutenant. 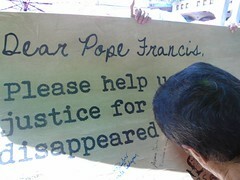 Despite the granting of the habeas corpus and amparo petitions, Jonas has not been located. Edita has sought help from various police headquarters, several congressmen and senators, including now President Aquino. She sought the assistance from the CHR, the National Bureau of Investigation and the Department of Justice. She also brought her case to the United Nations Human Rights Council, the US Congress and the European Parliament. “If Jonas was found and he learned that I did not look for him, that would break his heart. I don’t want that to happen. I want him to know that we really looked for him up to the end,” Edita said in the interview. 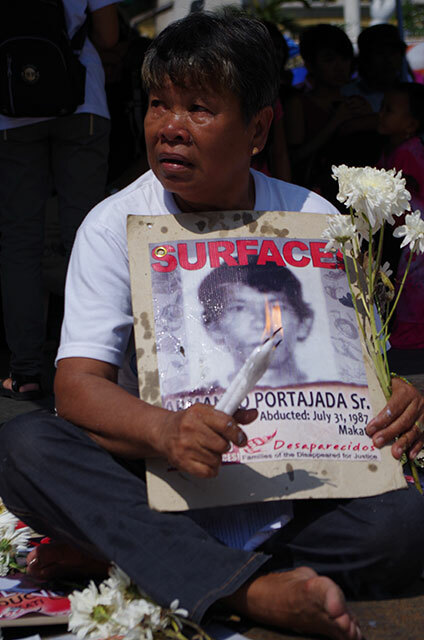 In 2013, somebody gave Edita a photo showing Jonas after his abduction and confidential military documents on his apprehension and psychosocial processing that the Supreme Court ordered not to be publicly disclosed. “When I imagine what they must be doing to my son, it’s torture to think that he’s still alive. We still have hope. But if he’s already gone, he’s not suffering anymore, he’s in the hands of God,” Edita said. Today is Tatay’s 7th year of disappearance. My father, Leo Velasco, disappeared under the Gloria Arroyo government. On that day, February 19, 2007, Tatay was walking along Pres. Aguinaldo St. in Cagayan de Oro. He stopped to buy a stick of cigarette when a gray Mitsubishi L300 van suddenly stopped and men grabbed him. I never saw him since then. I was shattered to find out Tatay was abducted. The first few hours of trying to find Tatay was excruciating. I worried thinking he was being tortured. Days passed and still there was no sign of Tatay. We went to military camps, police headquarters, asked assistance to the Commission on Human Rights, International Committee of the Red Cross and so on. Still, Tatay remain missing. My parents, being consultants of the National Democratic Front of the Philippines for the peace process knew the risks of fighting for the principles they believed in. Having comrades who were killed, tortured, imprisoned, disappeared, Tatay knew he might end up like them. He had told me about these risks, trying to build up the courage in me. He was aware that someday I might lose him in the same way. So, every year since that day I write Tatay a letter, hoping it would reach him wherever he is—in some dark detention cell perhaps? But this year, my letter is addressed to you, Mr. President. For after seven years of disappearance, Tatay is most probably not alive anymore. My logical mind tells me this. But, my hopeful heart says otherwise. 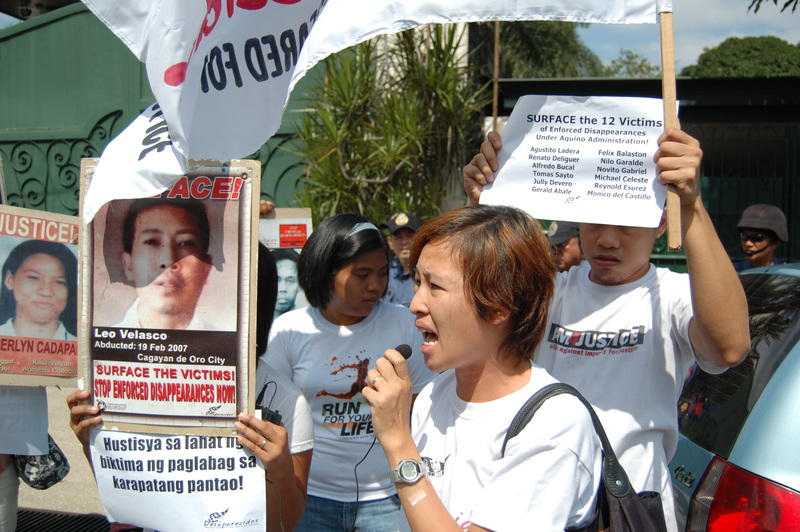 Since day one, I held Gloria Arroyo responsible for the disappearance of my father, and many others. But today, I am holding your government accountable for the continuing disappearance of Tatay and nine other missing NDFP consultants, and hundreds more of desaparecidos. Your government remains indifferent to victims like us who seek justice. 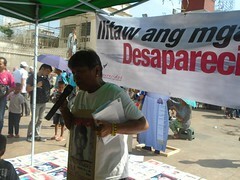 The Anti-Enforced Disappearance Law may be enacted. Yet, none of the perpetrators were actually prosecuted. The notorious rights violator Ret. Gen. Jovito Palparan remains at-large. I doubt if I will ever get justice for my father under your regime. You have even closed all doors for the continuation of the peace negotiations between the NDFP and your government, a venue for us relatives of missing NDFP consultants to address our concerns. This makes our quest for justice even dimmer. Today, my only desire is to know what had happened to Tatay, to get his remains, and put him in a proper resting place. I know that even this is too much to ask of you, Mr. President because to surface my father and the other missing persons will reveal a lot of dirty secrets in the military institution. But, you owe us. I’m sure anyone who has humanity would understand the kind of pain we families of desaparecidos are going through.